A rather bizarre animal love triangle has been making its way around the Internet this week. The key players? One frisky cat, one stuffed iguana and one very real iguana. A GIF posted to Imgur over the weekend shows the whole dramatic ordeal playing out. Although emotions ran high, thankfully no one was hurt in the altercation. Cat appears to overstep his boundaries, pawing stuffed iguana. Real iguana is not cool with that and gets all up in cat's face. Cat can respect that. Cat graciously bows out of the fight. 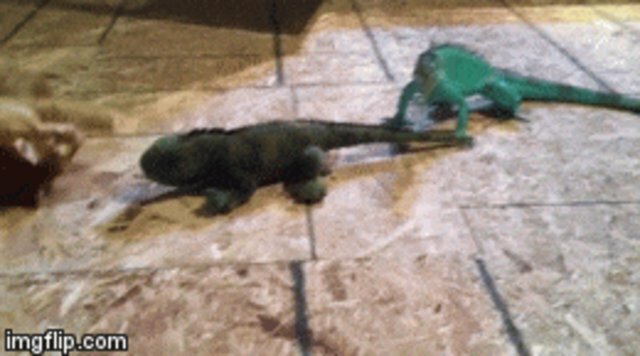 Somehow, this isn't the first time we've seen a real iguana get into a conflict involving a stuffed one. Just last month, a particularly aggressive iguana lost all chill and preyed on his stuffed companion.